Marc Berrebi is the co-founder of eDevice, the Bordeaux-based IoT (Internet of Things) pioneer and the preferred technology partner of the Remote Patient Monitoring world leaders. eDevice connects pacemakers, infusion pumps, dialysis machines and vital sign monitors. 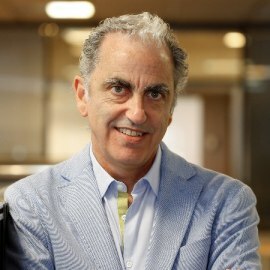 Before eDevice, Marc co-founded Marvin Software, which was acquired by Thomson Reuters after it became the world leader in financial calculation software, and Com6, which became public in 2000. Marc has received the Transformation Award from the University of Wharton, has been featured by TIME Magazine as one of the 25 European Tech leaders who change the way we work, live and play and has been named in the Wired Smart List as one of the 50 people who change the world. As the co-founder of eDevice, Marc has been rewarded the "Best Entrepreneur of the Year 2016” award by Ernst & Young in the Strategic Vision category. With a different name, Marc is the author of several art books and the producer of award-winning films presented at Tribeca Film Festival, the Festival de Cannes, and the IDFA-Amsterdam. eDevice is the leading provider of connected care solutions. For fifteen years, market leaders have been relying on eDevice to provide solutions that securely transmit medical data between their patients and their systems, with hundreds of thousands of connected patients to date. eDevice is the only company able to offer all the necessary components for the deployment of global connectivity solutions in a medical-regulated environment: medical hubs, worldwide cellular services, secure and interoperable cloud infrastructure, data and traffic management portals, medical front-end for patients and the care team. Dedicated to quality, eDevice’s solutions are ISO-9001 and ISO-13485 certified and include FDA listed devices. In 2016 and 2017, the company received an impressive list of awards, including Red Herring’s “Top 100 Best European Companies 2017”, Frost & Sullivan’s “Best Enabling Technology in mHealth 2017”, and the Digital Health Award from the HealthTech Summit. eDevice was also named “Best Independent Company of the Year” in 2016, by the French magazine L’Expansion. Through partnerships with technology leaders, the company brings innovative and reliable connectivity solutions to medical device manufacturers and currently connects more than 600,000 patients across the globe.